Hey Crew, heres a couple of pics of my first NEW sail. 2018 Ezzy Lion 9.5m. Sail comes set for rdm. So a quick measure of my sdm,change cams to suit the mast. Rig it as per spec. Minimal DH, crank OH to max pop cams on. Then zero OH. DH to dots on leach with recommended mast extension. Adjust Ezzy rig guide at medium to bottom of mast. Then OH to desired setting. Done! DH seems to need more force than Cheetah setup. Sail is drum tight. With plenty of profile. Feels mega grunty. Yet to sail the Big Lion.Looking forward to some RB Rippin. maybe a 7.0 ,and your quiver is complete . the lion is a grunter all right my 7.5 ...is like a truck pulling . Tardy, yep 7m Cheetah NEEDED. My GF can use it most days. Then when the fan is on PROPER i will use it. At 105kg i cant see me needing any less. Just gotta find a lime green one at the right price. ANYONE??? ok andrew remove the cams of the mast and take the boom of downhaul until the looseness lines up with the dots ,reset the bottom marker .then refit the boom let some out haul off fit the boom and out haul refit the cams and down haul to light,med or strong depending on conditions and then use strings to set outhaul to suit what down haul you have then take to the water and sail past every one please smile and be respect full while passing people. First sesh using the 9.5 Lion. WOW!!! This thing pulls like a train. 5-10kts had my F1 RB planing Ezzily. Nice Ezzy sail to hang on to. Super stable profile. Ezzy to carry to the beach. It just wants to fly. Its just EZZY EZZY EZZY alround. 5-10kts had my F1 RB planing Ezzily. Understand you are overly excited with your new sail but can you share you secret, planning in 5-10 knots? Not sure it is even possible on a foil!! I had a go of a 9.2m 2017 Warp in 12-18 knots and I could hardly sail the thing 100 metres such was the pull. 8.7m KA Race a few times as well and my forearms started to hurt after about 3 kms of sailing! 7.5m is about as big as I'd go. Its not so much the weight but the swing weight. 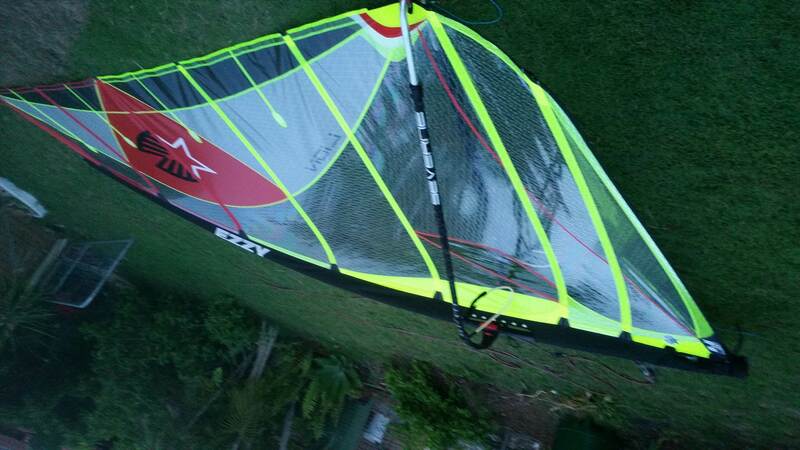 Still like to try that 9.5m Ezzy Lion sail though,it looks great. 5-10 knots planing is pretty much impossible on a windsurfer. Those hydrofoil kites are from a different planet when it comes to early planing. With a huge sail I'm guessing they can get going in 6-7 knots at the earliest. 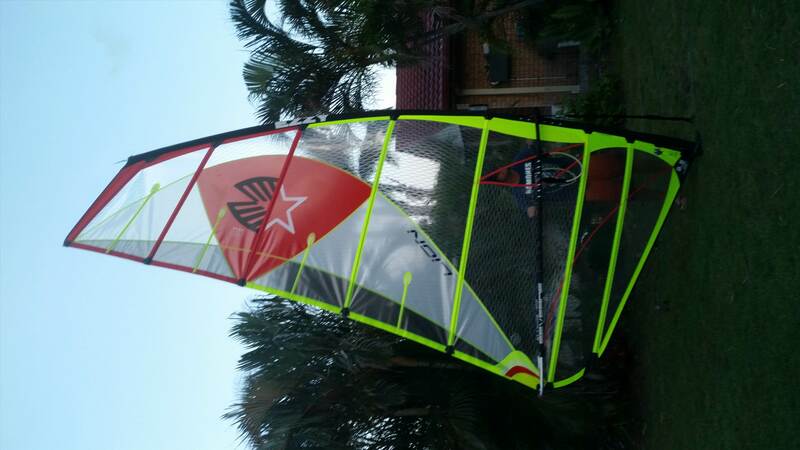 A 70kg windsurfer with a formula board and a 10 metre sail - around 9 knots. THERES ALWAYS A KNOCKER! Obviously planing on the gusts.So check 'Youtube Andrew Dark.' Latest post. Anemometer on the beach read 5kts on lulls n 10kts on the gusts. Very few whitecaps. Wind against tide. Local weather station was reading 8-13kts. Its on the open beach. Where i sail is shrouded by trees n is usually less than advertised. Check it out... then bow YOUR head in shame. I also have an 8m Warp. Great in constant 15kts n up. But in gusty conditions trying to push a 16kg raceboard, its got nothing. Even my 8m cheetah eats it. Ezzys have low down grunt. Just sayin. You gotta watch these big sucker on gybes ..you gotta catch early or they pull your arms out of the sockets . you need the board to match ..with good float ..since I only own a 130 litre biggest board now . a 8.5 is plenty for me . if I owned this beauty 9,5 lion ,I would get a 155 litre Patrick to match ...that will give the kiters a good match in light wind . Tardy, got it out again this arvo! Mad as!! 10-14kts about the limit on light setting.Actually found it easier to gybe than my 8m Cheetah. More grunt thru the turn. Can actually lean off it proper. Yep youre right. Miss time the sail flip n its like grabbin onto a big ol Rolls Royce Merlin powered Spitfire as it goes honkin past. Ripped me in a few times. Haha. Awesome to get some REAL grunt at last. My new GOTO sail. Yet to find my upper limit with this beast. i recon 18 knts going 'tear your bloody arms off' to quote a lady at the abc .good stuff hope you got more footage. Grich62, yep got about 2hrs worth of footage after work today. Yet to watch it all. More gopro action 2moro. Having a sail off with another RB mate. Think im going to get beat. Hes a solid fella. +15kg on me. Sailed for 30yrs. Good fun regardless. Grich62, unfair for who? We lined em up in 15-20kts. Max boardspeed logged =24kts.